When you’ve been grilling every day in every way for thirty years or so, you’re going to know a thing or two about BBQ. That’s how it is with the authors of this hand-picked, top-notch collection of grilling cookbooks. These folks are the pros. The ultimate pitmasters. And their books are our gateway to learning from the very best. Like all of us, I’ve noodled around on the internet looking for recipes. It’s fun and often useful, but the threads and forums can be confusing: One person says this, another says that. What’s the best way? The best way is to get it straight from the top. In this post, I’ll give you a highly selective rundown on the best grilling and BBQ cookbooks out there today, who wrote them, what they cover, and which one would be right for your needs. And don’t forget, unlike a website, they make great gifts too! A cookbook means you can always find that favorite recipe again, perhaps with your personal comments or tweaks noted in. A cookbook won’t go to sleep! OK, you laugh, but I was once elbow-deep in a beautiful thick BBQ sauce, slathering away at a big rack of ribs with my mop. Talk about sticky fingers! I looked to my device for the next step only to find it had switched to “sleep mode” and, covered in BBQ sauce, I couldn’t do a thing! A cookbook stays with you forever. With great advice and recipes from the nation’s top grillers, with gorgeous mouth-watering color photos. And makes a great gift. After extensive research (I mean I had to eat a lot of great barbecue…for your sake! ), here is my top ten. I’ve listed the pros and cons and specifically what I loved about them. I guarantee you will find at least one on this list that’ll hit the mark for you. Heat, smoke, proteins, fire. Who says barbecue isn’t all science? And nobody knows their stuff better than Meathead Goldwyn. 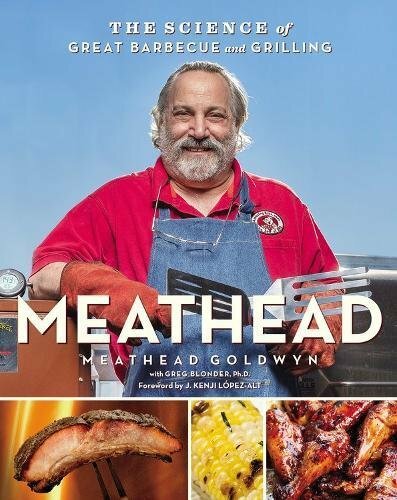 Meathead works in close collaboration with physicist and food scientist, Dr. Greg Blonder, to bring you not only dozens of terrific tried and tested grilling recipes (over 100), but also to explain the science behind good barbecue. This definitive book has been a New York Times Best Seller and spent months in the top 100 of all 8 million books sold on Amazon. The author, a self-proclaimed “Barbecue Whisperer,” lives and breathes food the way the rest of us do air. He’s photographed it, taught it, experimented with it, judged it, busted the myths, written the recipes and created one of the best-known barbecue and grilling websites. Learn from Meathead, and you won’t be routinely following a recipe, you’ll get better overall results from your grill as you understand more about what makes good barbecue. Anecdotal, chatty, wittily opinionated, like sitting down with a friend. A lot of science stuff! Reading Meathead’s book really helped me own the barbecue experience. I encounter fewer “pit falls” (read: failures! ), because I understand the process, the chemistry and the nuts and bolts. This is an essential foundational book and Meathead makes it fun to read. With 530 pages, this is the big kahuna of barbecue! 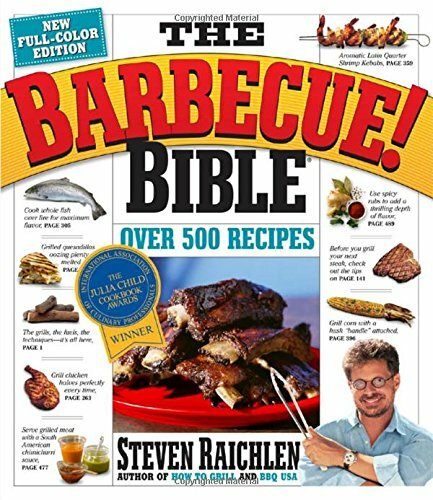 Author Steve Raichlen has made barbecue his life’s work with TV shows (Barbecue University, Primal Grill), several cookbooks including Project Smoke and Tailgating, and face time on Oprah, the Today Show, Howard Stern and the New York Times to name a few. Yup, this guy knows grilling. In this award-winning cookbook, Raichlen invites you into his world, with over 500 terrific recipes and all the tips, insider info and FAQ to help you pull them off like a pro. With hundreds of full-color photographs, Raichlen will introduce you to grilling recipes from all over the world and teach you all the prep, techniques and ingredients to up your grilling game. Comprehensive coverage of all things barbecue. I love all things Steven Raichlen and with this book, you can take your grill right around the world, trying everything from South African Spiced Snapper to Portuguese Piri-Piri Sauce (not for the faint-hearted). Just don’t sit and read it in an armchair…it’ll make you too hungry! Grilling happens all over the country…all over the world…and yet somehow we still think of the Southerners as the ultimate pros. And here’s the book to prove it. 368 pages of mouthwatering photographs, easy-to-follow recipes and plenty of helpful tips for the backyard griller from how to choose a cut of meat to when to cook low and slow and when to cook fast and furious. Author Chris Prieto, owner of Prime Barbecue in Wendell, North Carolina, makes learning new techniques a snap with clear step-by-step instructions for his 200-plus recipes. and pit tips and techniques a-plenty. 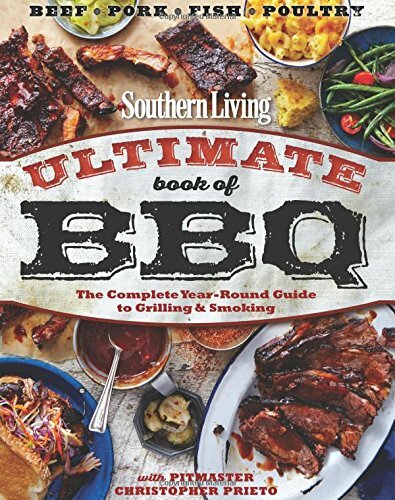 This comprehensive and inspiring book is an excellent choice – and a great gift — for the griller who wants to master the basics of barbecue, and then take it to the next level with new recipes and sound know-how. It’s your one-stop-book for the whole cookout from ribs to rubs, sides to sauces. clearly laid-out easy-to-follow recipes…and lots of them! Learn it from the folks who know barbecue inside out and back to front…The South IS barbecue! Covers the whole cookout from sauces to sides to salsas. This collection is solid and Southern. If you’re looking for more contemporary twists on grilling with a lighter touch, this isn’t it! There are some Southern ingredients that I only understand now I’ve cooked from this book…okra, cornbread, molasses. And believe me, it’s all good! This fascinating cookbook gives the reader an epic perspective on man’s relationship with that most primal of elements: fire. 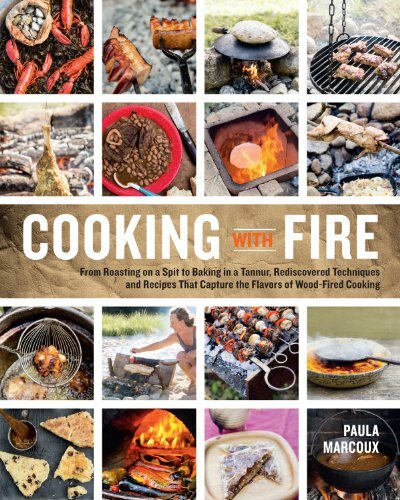 Author Paula Marcoux’s passion for her subject shines through the pages as she takes us through the centuries and around the world explaining the many varied and delicious ways man and fire have come together. Full of solid information for the beginner and innovative ideas and suggestions for the established griller, Marcoux makes the clear point that everything barbecue begins and ends with the flame, which is why it’s so important to get it just right. Clearly a fan of being in touch with nature and things ancient and elemental, Marcoux shows the reader how to build all manner of outdoor grilling structures from roasting hearths and spits to bread ovens, all the while couching her information in historical context. An archeologist by training, Marcoux’s writing is so compelling that you will find yourself picking up this book after dinner just to soak up the information. Ever-practical Marcoux gives us useful tips for how to make best use of what you have at hand. Plus, the section on fire, what it is, how it works, and how to build it, is essential reading for all grillers. This essential cookbook is your all-in-one lesson in the art and alchemy of smoking. 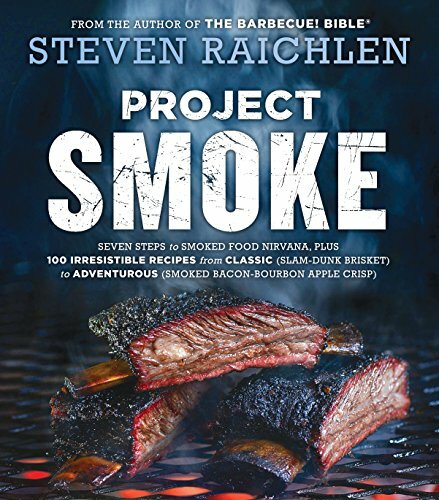 Multi-award-winning author Steven Raichlen, famed for his extensive collection of cookbooks and TV shows, will take you through every step of the smoking process from types of smokers and the subtly different flavors of various woods, to the techniques of brining, rubs and marinades. Techniques you didn’t even know you needed to know are covered in this comprehensive guide: hot smoking, cold-smoking, tea-smoking, stovetop smoking, smoke-braising, and the ultimate in primal cooking: “caveman” smoking directly on embers. Soak up Steven’s wisdom, and you’re ready for his slam-dunk collection of mouthwatering recipes. Warning: this book will make you hungry even if you just ate! Learn from the best, Steven is arguably the grand master of the pit and he has the books, accolades, awards and TV shows to prove it. All-in-one primer with tips, techniques, equipment, and ingredients as well as terrific recipes. Some of the recipes may be too exotic for the beginner or everyday griller. I’ve always been intrigued by the ways different woods impart flavor to food and Steven explains this well. And Smoked Chocolate Bread Pudding?? OMG…bring it on! He bought the trailer, took brisket to a new nirvana, and now he’s written the book. Thank goodness! Because we need to know how he does it! Winner of every barbecue award out there, Aaron Franklin now shares his secrets to melt-in-the-mouth barbecue with us, his drooling hungry wannabe readers! And remember, these skills are not easily come by…top pitmasters like Franklin experiment and work over their techniques for years before they are 100% satisfied with the result. All you have to do is crack open the book! A lot of what makes great barbecue is hard to pinpoint, there is no one-size-fits-all rubric (and good thing too or that food would be sooooo boring!). Barbecue is all about variables: the weather, the wood, the meat, the pit, and of course the cook! 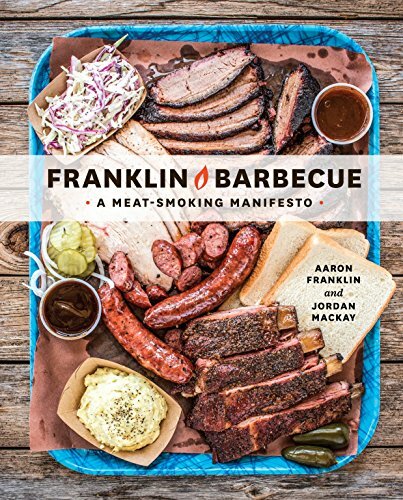 In this cookbook, Franklin expertly harnesses these mysteries and helps guide the reader to their own unique success at the smoker. With Franklin, you will learn how to build or customize your own smoker; find and cure the right wood; create and manage the perfect fire, and select top-quality meat. This is Franklin’s first foray into writing. But just like his trailer, now boasting the longest lines out the door (folks are setting up with coffee and camp chairs at 6am every day here, no kidding), he knocks it out of the park. I love that Franklin does not try or pretend to do it all. Instead, he focuses on a couple of things and goes into incredible and expert depth in that. This nuts-and-bolts guide to all things grilling is an excellent cookbook for novices as well as an indispensable go-to reference and recipe book for the experienced griller. I love all the photos not just of delicious meals but the clear prep steps to get there. Nothing better than learning it from a photo! You’ve got the whole team at America’s Test Kitchen behind you with this hefty 454-page volume. Food scientists, test cooks, editors, tasters, and cookware specialists have done all the research for you, covering everything you need to know from choosing the right tools and equipment to how to cut and trim different cuts of meat. I’m not a wing-it kind of person at the grill. I like steps, diagrams, details, and explanation of why or why not a technique works. This book nails it for me in every way. It’s the reference book you always want to keep close by when you’re grilling. Learn it from the legend. 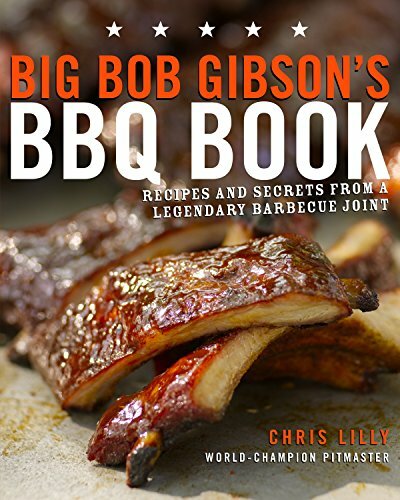 Big Bob Gibson was grilling up a storm back in 1925 and now his great-grandson-in-law, Chris Lilly, a world champion pitmaster in his own right, has recorded all his wisdom and lore in this entertaining and inspirational cookbook. Gibson’s restaurants in Decatur, Alabama, which Lilly now heads up, have been Winners of the World Championship BBQ Cook-Off for six years in a row. Those same treasured award-winning recipes are now available for us to share, along with insider tips on controlling heat, selecting wood, best pairings with sauces and much more. Lilly takes the reader through the entire low-and-slow grill process from setting up the grill, to temperature gauges and even how best to position meat on the grill. Lots of color photos and equally colorful stories! A lot of history of Big Bob’s line of restaurants and products. This book introduced me to delicious tangy white barbecue sauce, once a closely-guarded family secret, now a staple in Alabama barbecue. Who knew? This is one you just have to try. If you’re looking for the new frontier in grilling, this is it. Argentinian-born, French-trained author-chef, Francis Mallmann, marries perfectly the ancient art of wood-fired cooking techniques …seven of them, to be precise, as the title promises…and exciting new and unexpected adventures in flavors. This is sophisticated barbecue from South America’s trailblazing culinary hero who successfully pushes the boundaries of traditional grilling, yet still keeps recipes simple, at times even rustic, and always unpretentious. With recipes like Burnt Oranges with Rosemary and Whole Andean Pumpkin Salad with Mint, Arugula, and Goat Cheese, this cookbook keeps the cookout healthy and light. The Argentinians are passionate about fire and meat, and Mallmann is no exception. Before he takes his readers through his 100-plus superb and often innovative recipes, he explains in fascinating detail the “Life of a Fire”–flames, coals, embers, ashes and cinders – and how each stage plays an important part in the cooking process. 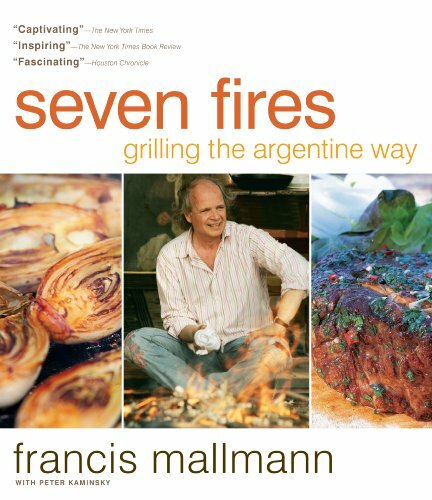 Mallmann also gives you plenty of creative ideas for adding on to your backyard grilling set-up with instructions on how to set up and cook using asado, a parilla, a chapa and a cob oven to name a few. Will inspire you to go build new grilling and smoking structures in your backyard! I never knew I needed a horno de barro but now, like many of Mallmann’s readers, I’m smitten. Plus, you’ve got to love any recipe that starts “ingredients: one medium cow, about 1400 lbs! Ever wondered how barbecue differs from region to region in this big ol’ country? Champion pitmaster, Mike Mills, will show you. 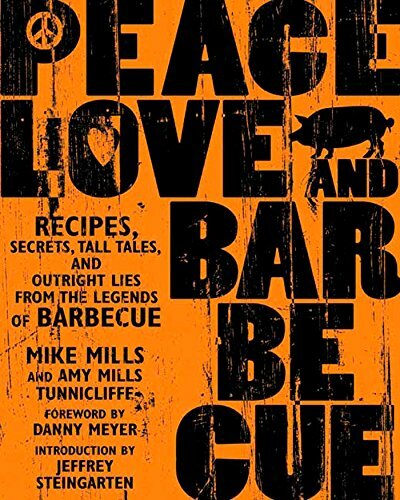 On this tasty “pit-stop” tour of America’s hotbeds of finger-licking barbecue, Mike shares stories of his travels, a bounty of prize-winning recipes and entertaining encounters with some of the more colorful characters from the grilling world. Mike entertains as well as teaches his readers. Part-cookbook, part coffee-table book, this collection makes a great gift for the griller who loves the culture and regional differences as well as the food of barbecue. Full of practical advice, ideas, and inspirations, this is the book that’ll fire up your grill game again when you’re in a rut. Focusing mainly on charcoal and wood-fired grills, Mike takes you from the fundamentals of grilling and smoking to the highly sought-after recipe of his famous seasoning, “Magic Dust.” He also includes a handpicked selection of the best recipes from other competition pitmasters. This book makes me feel like I’ve been let in to a secret club! Mike takes you behind-the-scenes and shares unique insider tips and hot-off-the-griddle secrets. If you think you know barbecue, read this book. Then you’ll know barbecue. I have a shelf just for my barbecue cookbooks. Old friends that I turn to on a near-daily basis. And I can tell you that a good number of the books reviewed above are on that shelf. These are in my opinion the best. And their authors know barbecue inside out. So read the tips, learn the secrets, and be entertained by the stories. 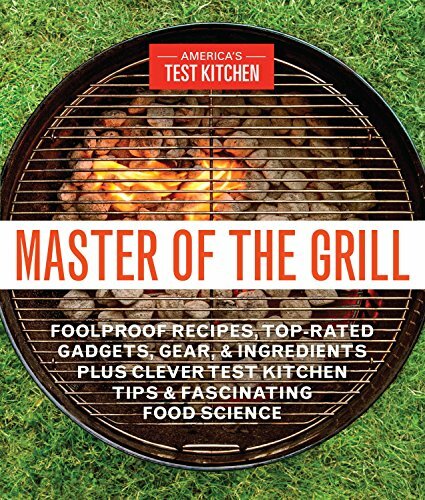 I hope this roundup of the best grilling cookbooks helps you choose the right ones to take your game to the next level. You can’t go wrong with any of these. They all have the right ingredients! What’s your favorite grilling cookbook? Did you choose one from here? How did you like it? We’d love to hear from you in the comments below! Please share your story and share this post. Let’s keep spreading the love of barbecue!